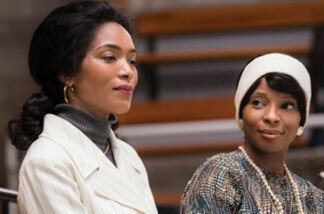 Angela Bassett and Mary J. Blige in Lifetime’s Betty & Coretta. Photo Credit: Jan Thijs. Lifetime will kick off Black History Month in February with the film Betty & Coretta, starring Angela Bassett and Mary J. Blige. The movie is executive produced by Blige and also stars Malik Yoba and Lindsay Owen Pierre. Focusing on the extraordinary women behind the two men who would change history, Betty & Coretta tells the similar true stories of Coretta Scott King (Bassett), wife of Dr. Martin Luther King, Jr. (played by Yoba) and Dr. Betty Shabazz (Blige), wife of Malcolm X (who is played by Pierre). “When their husbands were tragically assassinated, these two women not only inherited the mantle of the civil rights movement in America, each also found herself to be a single mother who had to find a way to raise and support her children with no husband or father, resulting in a relationship like no other that spanned more than three decades,” reps for Lifetime said in a press release. Betty & Coretta will premiere on Lifetime Saturday, Feb. 2 at 8/7c. Follow Chris Witherspoon on Twitter at @WitherspoonC.